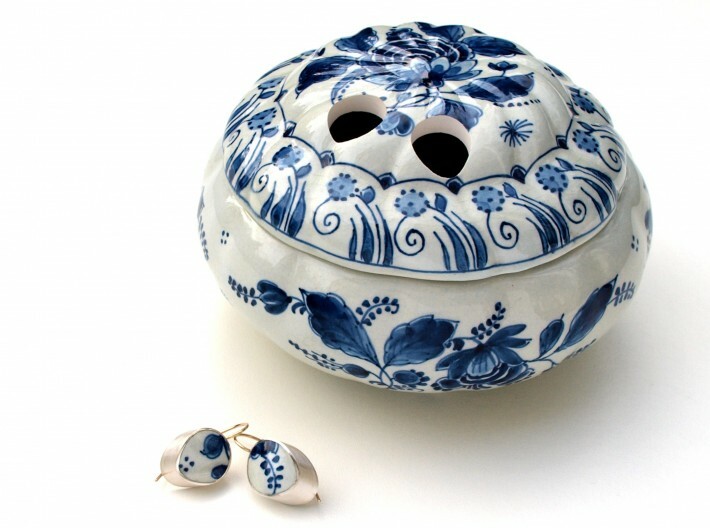 Closing this week at Sienna Gallery in Lenox, Massachusetts is “Gésine Hackenberg: Blue White and Others”, an exhibition of the artist’s ceramic jewelry. 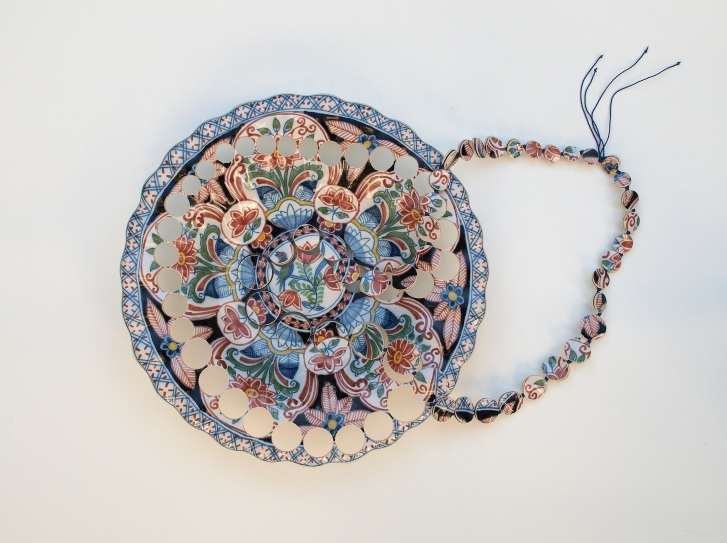 Hackenberg drills pieces out of earthenware plates, dishes, and bowls to create unique necklaces, rings, and earrings. The earthenware beads are thread together into necklaces while the earrings and rings are set into gold or silver. As much as I adore the work, I am attracted to the questions that Hackenberg raises with her jewelry. If certain plates or cups are sacred to us because of the memories that they evoke, can we preserve those memories but giving the object a new life and adorning our bodies with it, therefore carrying that memory around with us? 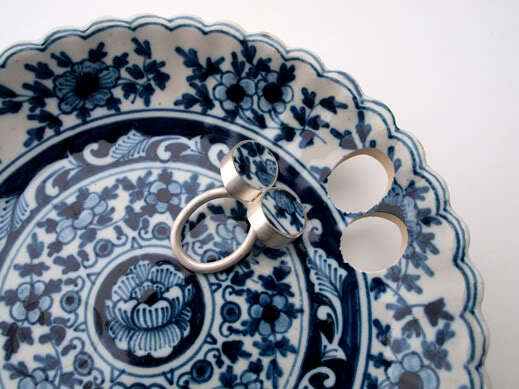 The blue and white colors, most often associated with Delftware- which the Amsterdam-based artist has ample access to- are incredibly popular but Hackenberg has also started working with Faïence ware from the Koninklijke Tichelaar Makkum manufactory as well as plain white kitchen ceramics. Hackenberg’s most recent body work, called “Daily Delicious” veers in a completely different direction and focuses on fruits and vegetables made out of copper and worn as necklaces or brooches. Although the ideas are still the same: making something ordinary so extraordinary. “Gésine Hackenberg: Blue White and Others” closes on November 30th. For more information visit the Sienna Gallery website. cartilage earrings and I think that I am extremely lucky for doing this. I believe that this is a very handsome blog you got here! and header of your post:”Gésine Hackenberg: Girl with a Ceramic Earring “? Absolutely! Thanks for your visiting. Many more posts on art jewelry coming soon.